Dance all in one show! Chinese dance! Folk, classical, and contemporary, all in one night. That is exactly what the Atlanta Chinese Dance Company’s world premiere of Ming, Gu, Xian has to offer. Artistic director and choreographer Hwee-Eng Y. Lee, whose eclectic background ranges from Chinese dance, to ballet, to modern dance, has choreographed and compiled an assortment of Chinese dance works from a wide range of sources into three main sections: folk (“ming jian”), classical (“gu dian”), and contemporary (“xian dai”). The program is made up of mostly new works, along with a few other favorites, including an expanded version of the critically acclaimed “Yellow River Piano Concerto” from ACDC’s production of In Search of the Imperial Palace in May 2003. The Ming section presents a collection of Chinese folk dance (“ming jian” dance), which has evolved from the movements of the common people. The subject matter of the dances reflects the lifestyle of the villagers, ranging from work, to social life, to their interaction with nature. Classified by geographic location, the scope of Chinese folk dance encompasses many different ethnicities in China, including the Han majority and the Zhuang, Dai, Xin Jiang, and Tibetan minorities. Lee uses the well-known Chinese folktale "Pull the Carrot!" as a background for the "Ming" section. This light-hearted story has an important underlying theme: although a daunting task can seem impossible alone, it can be accomplished with perseverance and the aid of other people. Ming, Gu, Xian also marks the premiere of the Zhuang minority into ACDC's repertoire. The Zhuang minority, who resides primarily in China's Guangxi province, is the most populous minority ethnic group in China. Other folk dances new to ACDC's repertoire include "Xin Jiang Dance: Picking Grapes," "BoatLovers," and "The Little Pepper Girl," each of which represent a different aspect of the daily lives of the Chinese villagers. The Gu section presents Chinese classical dance (“gu dian” dance), a subset of Chinese dance which exemplifies the beauty of the classical Chinese lady as represented by mural painters and poets of the Tang Dynasty (618-907 AD). As three girls embark on a journey into the caves of the Gansu province, they come across the ancient mural paintings of Dun Huang. As the ladies in the painting come alive in their minds, the stage is transformed into a heavenly setting, with flying apsaras surrounding them from all sides. The presence of the glorious female warrior Mulan in the "Gu" section introduces another side of the classical Chinese lady. 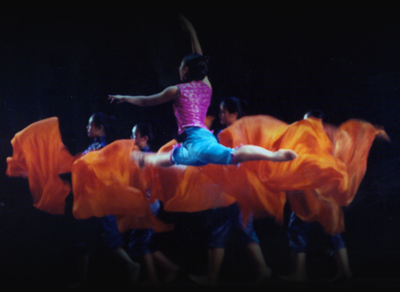 This Tao Li Cup award-winning piece, new to ACDC's repertoire, presents Chinese dance in a unique way, as it uses the recitation of the "Ode to Mulan" in conjunction with music as the background for the dance. The story of Mulan as it is told today comes directly from the words of this famous poem. 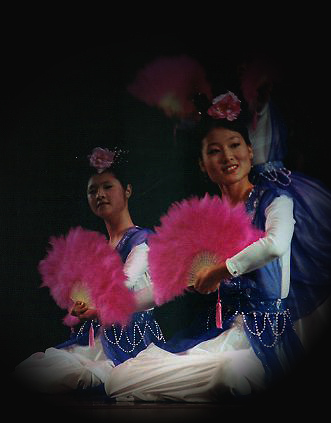 The last section Xian accounts for the influence of modern dance ("xian dai" dance) on traditional Chinese dance today. The score of the “Yellow River Piano Concerto,” arranged for piano and orchestra after the “Yellow River Cantata” by Xian Xinghai, symbolizes the junction between Chinese and western cultures. ACDC’s “Yellow River Piano Concerto” is staged by Hwee-Eng Y. Lee after Beijing Dance Academy’s propless version of “Yellow River.” Lee’s addition of props offers a survey of many of the major ones used in Chinese dance, including ribbons, fans, scarves, sleeves, and umbrellas. Whereas last year’s “Yellow River Piano Concerto” from In Search of the Imperial Palace was set to the fourth movement of the piano concerto, ACDC’s newest version uses all four movements, where each movement represents a different aspect of the struggle of mankind with the horrendous flooding of China’s sorrow. Featured in this section are three guest artists from the Atlanta Ballet--Tara Lee, Tian Shuai, and Tamila. 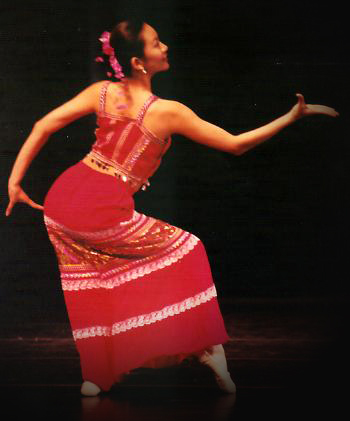 The Atlanta Chinese Dance Company has a thirteen year history, in which they have served both the Chinese and non-Chinese communities in metro Atlanta and surrounding areas. Founded by Ms. Lee, the company trains over seventy dancers, aged five to adult, who are residents of the metro-Atlanta counties. The majority of them have many years of performing experience with the company. The company has appeared in the Opening and Closing ceremonies of the 1996 Centennial Olympic Games. They have also appeared in the Chinese variation of Atlanta Ballet’s holiday production of The Nutcracker for the past six years. In addition to the In Search of the Imperial Palace, A Journey with the Phoenix, and Bamboo Forest of Yunnan, which were held in the Gwinnett Civic and Cultural Center, the company has presented performances in such theaters as the Robert Ferst Center for the Arts and the Rialto Center for the Performing Arts. ACDC has also participated in Festival of Trees, Decatur Arts Festival, Georgia Tech International Festival, International Children Day organized by North Fulton County Arts Council, Chinese New Year festivities at the Chinese Cultural Center and other venues, City Hall Atrium, King Center, Underground Atlanta, Emory University, World of Coca-Cola Atlanta, Hunger Walk, Stone Mountain Park, Colony Square, Fernbank Science Center, Piedmont Park, Centennial Olympic Park, public schools and private schools, etc.. In addition to performing in Atlanta, the company has also made an appearance in Knoxville, Tennessee, where they presented a performance at the Performing Arts Center in Pellissippi State Technical Community College, and in a few elementary schools near Greenville, South Carolina. This program is supported in part by the National Endowment for the Arts as well as the Georgia Council for the Arts through the appropriations of the Georgia General Assembly. The Council is a Partner Agency of the National Endowment for the Arts.